I find a visual approach most useful at this preparatory stage. I often started drawing when I was in a meeting with the workshop organizers. 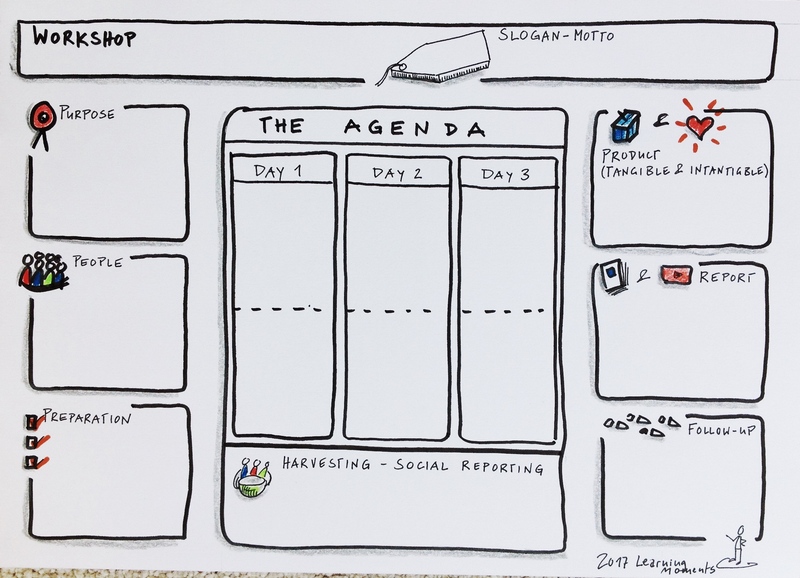 I have now developed a visual template – the agenda shaper to help others with this process. The Workshop Shaper – a template for a visual clarification and design process. Early in the process, you sit together with the organizers. Guided by the agenda shaper you clarify step by step the various aspects of the workshop. All people present in the planning meeting are invited to help fill in the agenda shaper; preferably you write on post-it notes to gain flexibility. I advise to first address the questions on the left and right side before jumping to the agenda. After these steps, you jointly develop a first rough working agenda. At this early stage, it is more a brainstorming for possible activities (with unconventional ideas welcomed); the precise agenda is developed later. Purpose: Why are you organizing this workshop? What are you trying to achieve? Participants: Who should be participating? What is their motivation to join? What is their perspective regarding the workshop topic? Which experiences, know-how and knowledge do they bring to the table? What are their main questions? How can we involve the participants into the invitation and preparation process? In their hands (documents, action plan etc.)? In their minds (insights, ideas, new questions, intentions and plans for next steps)? In their hearts (motivation, interest, joy, friendship, belonging etc.)? Follow-up process: What is the bigger process this workshop is part of? How is this workshop contributing to the whole process? What will happen after the workshop? Harvesting and social reporting: How do we harvest our learning? What kind of report is needed? Is social reporting and/ or graphic recording an option? How can we include participants into the reporting process to boost reflection and learning? And finally, the agenda: What kind of “workshop world” and atmosphere must we create to achieve what we are aiming for? What does this mean for the agenda and the workshop room? How could we start the workshop in an engaging and connecting way? What happens at the beginning, in the middle and at the end? How can we bring the workshop to a meaningful conclusion and assist the transfer of learning already during the workshop?